Made entirely of gleaming brass, this unique cuff is made by South African artisans who use high heat to color the layers of brass, adding depth and beauty. No dyes are used. 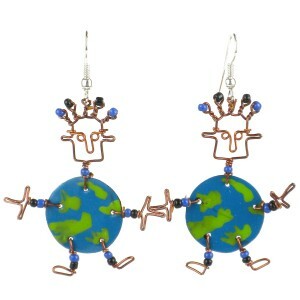 Each item is entirely handmade. Bracelet dimensions: 1.5 wide x 7 inches long. 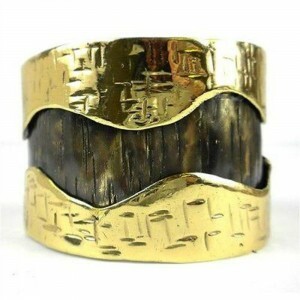 Tags: brass bracelet, brass cuff, brass cuff bracelet, Fair Trade, handmade, Handmade in Africa, made in africa. 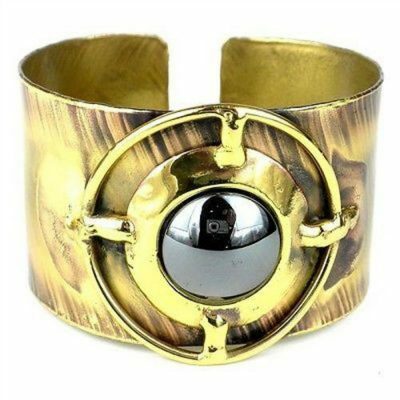 A large hematite stone is inlaid in a compass of polished brass on this brass cuff handcrafted by South African artisans, who apply high heat to the metal to achieve the coloration and patterns. 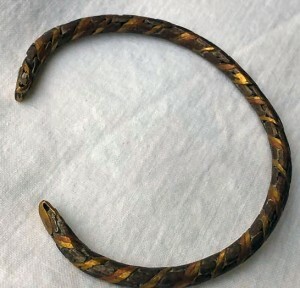 Bracelet dimensions: 1.5 inches wide x 7 inches long. As each is handmade, your bracelet may very slightly from the product image. Made in South Africa by Brass Images. Brass Images was extablished in 1988 in the coastal town of Plettenberg Bay, South Africa, about a 4 hour drive out of Cape Town . The long lasting success of the project is due to the fact that the group develops new designs on a regular basis and pays great attention to detail and quality. Brass Images employs 15 people from the local community to help create high quality fashion jewelry. As demand grows, the organization hires and trains more artisans, providing sustainable income in an area in need of employment.